Synopsis: An account of the American solider and sniper, Chris Kyle who went on to become one of the most deadly snipers ever in history. Review: War, a topic that is never far from the news and one that dominates many lives on this planet. We all read about events such as World War 1 and World War 2 through our history classes, and the documentaries that we watched in school. It comes to life through pictures and documentaries. Yet with a story focusing on a war that is ongoing featuring events such as 9/11 that are still fresh in the minds of many, that is treading a fine line as controversy is bound to ensue with certain things. Without question this film has had its fair share of controversy. Zero Dark Thirty a similar film focusing on the Iraq War, also attracted criticism and controversy over certain elements. 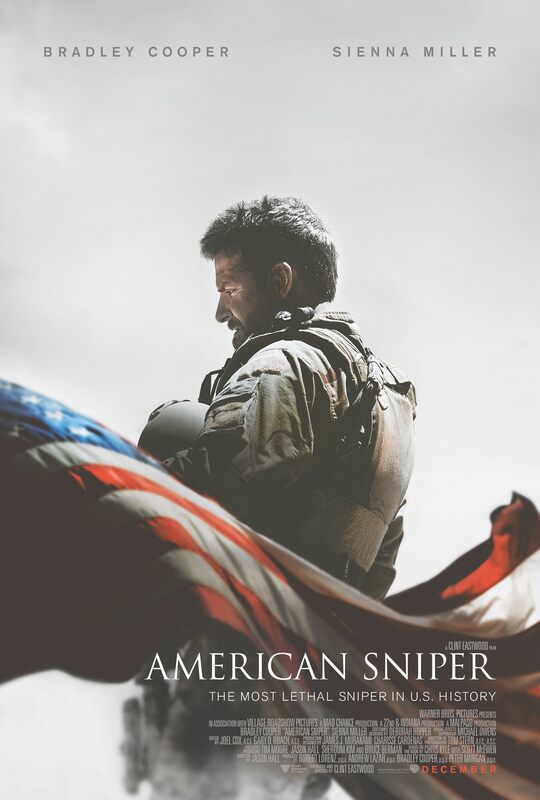 Yet through all of the controversy, it was a storming success, the same can be said for American Sniper. The film focuses on real life Navy SEAL Chris Kyle played incredibly by Bradley Cooper who scooped his third consecutive Oscar nomination for the role. When 9/11 happens, we see a man who becomes enraged and seeks to go out there and defend what he believes to be “the best country on Earth.” He is very patriotic and a firm believer in honour and duty. Through extensive tours in Iraq and many many kills later, he firmly establishes himself as a US military hero. Yet through all his tours and military exploits, there are consequences that he must deal with. Namely that war will take its toll on you, chip away at your life and the lives of your family members. Throughout the film we see how once he comes home from another tour, he is not the same man he was when he went away. With each tour he goes on, he comes back almost a completely new person, becoming increasingly cut off from society. Through Cooper’s excellent performance, we see that the man is hailed as a hero by his comrades, but the film does not bask him in complete glory, what we have is a man who is troubled by his exploits. he is joined by his wife Taya Kyle (Sienna Miller) We see through her eyes how the man she married is not the same through each tour that he embarked upon, and every time he returns, the distance between the couple grows wider and wider. The nature of war and the damaging effect it can have on any person who fights are very well realised both in the performances of Cooper and Miller and in the screenplay, adapted from Kyle’s autobiography, penned by Jason Hall. Through the hands of veteran director Eastwood, the film like its titular character, found its aim, and he was right on target. The man and the legend has gone through a mixed spell recently with Jersey Boys and J. Edgar not receiving the best of receptions critically. However, he has delivered an emotional war story. The action scenes packed throughout the film are directed very well, some of which are particularly intense. A decision that could result in the deaths of 20 US soldiers rests in his hands and it is nerve-racking viewing. The action scenes are accompanied by a fantastic score composed by The film has been blasted by some as nothing more than American propaganda, yet the film does not glorify the events you see on screen. It really highlights the ugly, brutal side of war that as previously mentioned will take its toll on a person. The film could have explored numerous other themes of the Iraq War, yet it chooses to narrow its focus about this one man, and the effects that go along with going to war, and what having over 160 confirmed kills to your name will do to your life and the lives of your family. With a very sombre conclusion given what happened to Chris Kyle, the audience is reminded that fighting in a war will have its far reaching consequences, and in some cases it will have a melancholic and heart breaking ending. Anchored by another superb Bradley Cooper performance, and top notch directing by Eastwood, it provides a tense and heart breaking story of one man and the damaging effects of war. While I think a bit more could have been done with Kyle, I was enthralled throughout, and Cooper just keeps getting better and better. Great review. Thank you very much man! I agree, they could have done more with Kyle, that being said Cooper was superb and I think it’s only a matter of time before he bags an Oscar!